The job of the crew chief has certainly changed since I held that position, ... Today, the job of the crew chief is almost too big for one person. 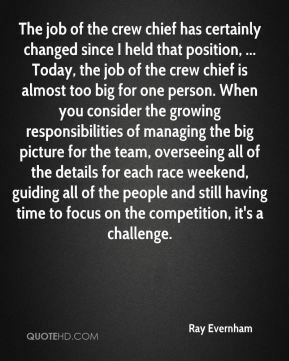 When you consider the growing responsibilities of managing the big picture for the team, overseeing all of the details for each race weekend, guiding all of the people and still having time to focus on the competition, it's a challenge. 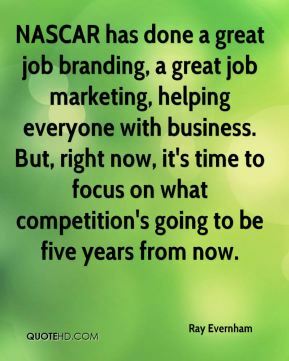 NASCAR has done a great job branding, a great job marketing, helping everyone with business. But, right now, it's time to focus on what competition's going to be five years from now. 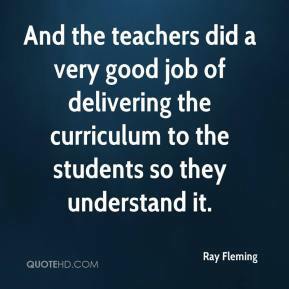 And the teachers did a very good job of delivering the curriculum to the students so they understand it. 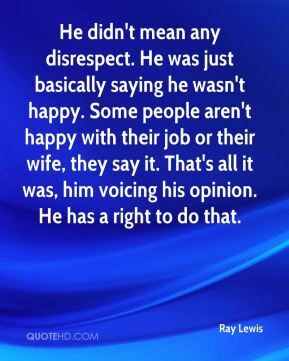 He didn't mean any disrespect. He was just basically saying he wasn't happy. 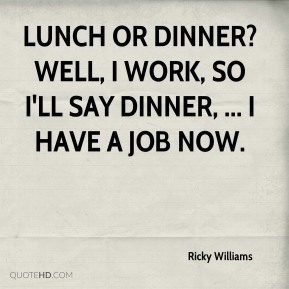 Some people aren't happy with their job or their wife, they say it. That's all it was, him voicing his opinion. He has a right to do that. Don't let them fool you that we have a deal. We don't. 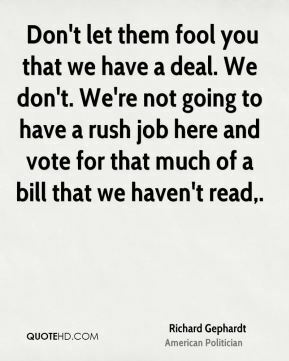 We're not going to have a rush job here and vote for that much of a bill that we haven't read. We're very proud. 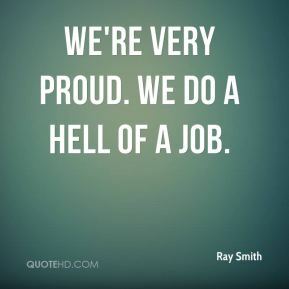 We do a hell of a job. 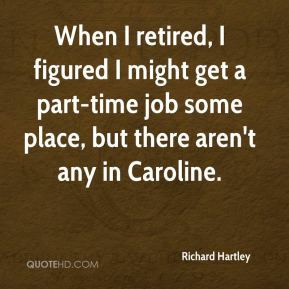 When I retired, I figured I might get a part-time job some place, but there aren't any in Caroline. 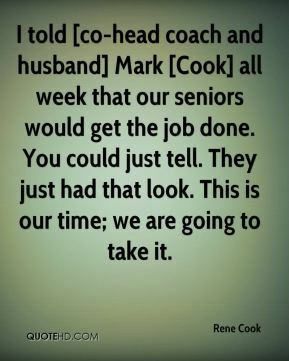 We didn't do a very good job of playing through each other or through the people we should have been. And then we got cold. They were hitting shots and mainly it was a lot of defensive problems. 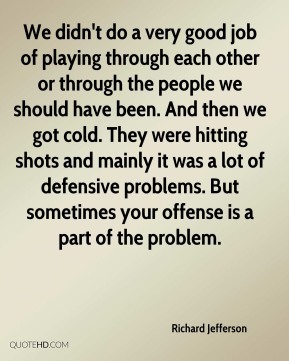 But sometimes your offense is a part of the problem. 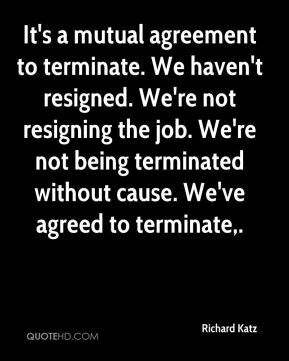 It's a mutual agreement to terminate. We haven't resigned. 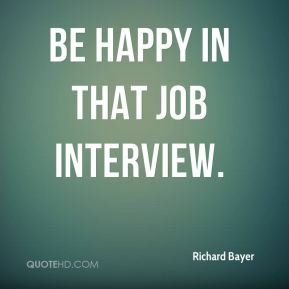 We're not resigning the job. We're not being terminated without cause. We've agreed to terminate. 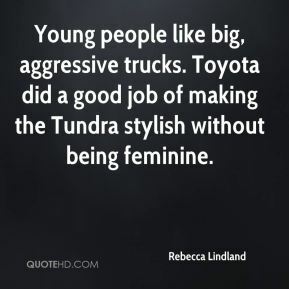 Young people like big, aggressive trucks. Toyota did a good job of making the Tundra stylish without being feminine. He's never missed a beat, and he's done a terrific job since. 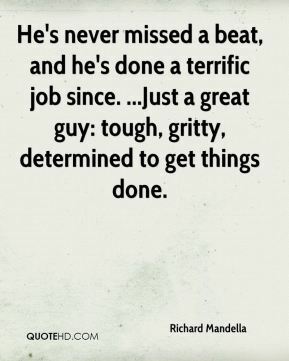 ...Just a great guy: tough, gritty, determined to get things done. 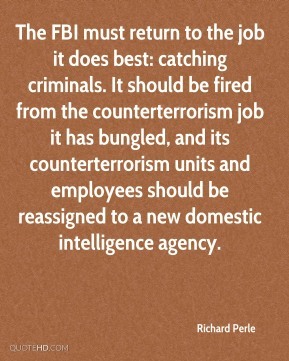 The FBI must return to the job it does best: catching criminals. It should be fired from the counterterrorism job it has bungled, and its counterterrorism units and employees should be reassigned to a new domestic intelligence agency. 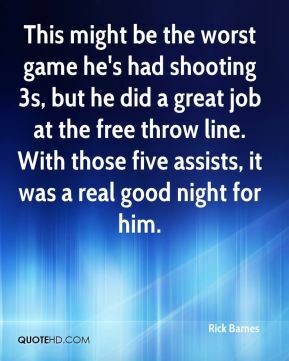 This might be the worst game he's had shooting 3s, but he did a great job at the free throw line. With those five assists, it was a real good night for him. They did a nice job really to lull us to sleep in the first half. There were doing what they needed to do. We decided to press in the second half. 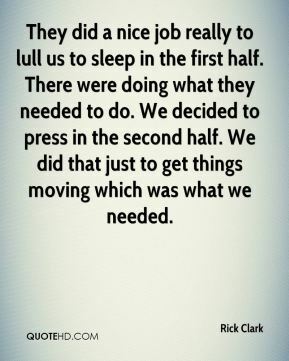 We did that just to get things moving which was what we needed. Shane did a great job. That's nice to have going into the last two games. 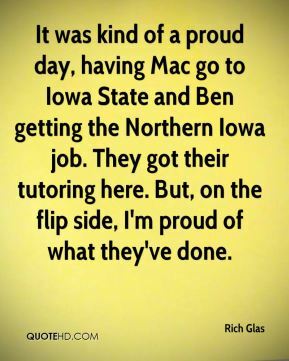 It was kind of a proud day, having Mac go to Iowa State and Ben getting the Northern Iowa job. They got their tutoring here. But, on the flip side, I'm proud of what they've done. 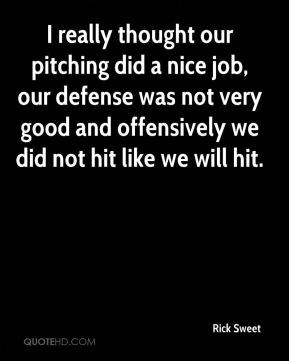 I really thought our pitching did a nice job, our defense was not very good and offensively we did not hit like we will hit. 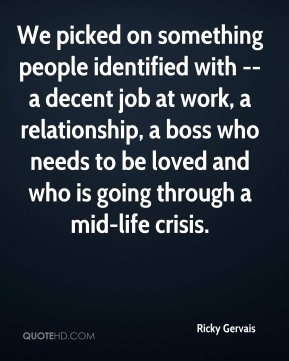 We picked on something people identified with -- a decent job at work, a relationship, a boss who needs to be loved and who is going through a mid-life crisis. 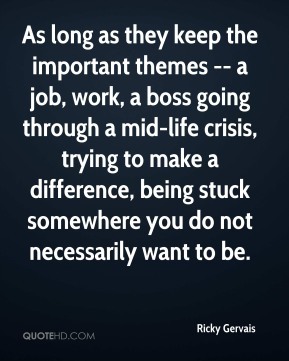 As long as they keep the important themes -- a job, work, a boss going through a mid-life crisis, trying to make a difference, being stuck somewhere you do not necessarily want to be. Man, did we run the football really well, ... It all starts up front. 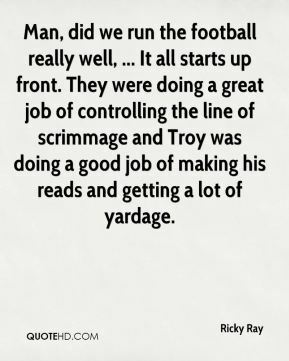 They were doing a great job of controlling the line of scrimmage and Troy was doing a good job of making his reads and getting a lot of yardage. 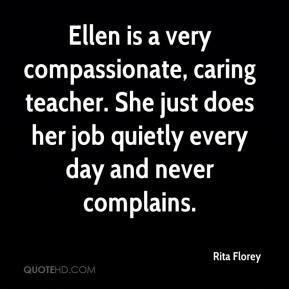 Ellen is a very compassionate, caring teacher. She just does her job quietly every day and never complains. My job has always been to do educational theater. This is a great learning experience for actors because the audience is so close. And I like to offer the college and the community different types of plays and these are different.